Less than three months ago, in August 2018, X-ZELL CEO Dr Sebastian Bhakdi took to stage at the 19th Asia-Pacific Prostate Cancer Conference in Brisbane (Australia) to reveal an unexpected breakthrough in early cancer detection. Using a new platform technology capable of identifying ultra-rare cells in small blood samples, Dr Bhakdi and his team had found a way to isolate and visualize Circulating Endothelial Cells (CEC) in a routine laboratory. Shed from the blood vessels of early-stage, malignant tumours, CEC are powerful, yet extremely hard-to-locate cancer markers that have long been branded ‘too hard to find’ to be considered for routine applications. In collaboration with Mahidol University’s renowned Siriraj Hospital in Bangkok, Dr Bhakdi had finally solved the elusive cells’ mystery, prompting oncologists around the globe to fundamentally rethink traditional diagnostic pathways. With access to biomarkers that not only pinpoint earliest-stage cancers, but also distinguish between aggressive and non-aggressive disease, the opportunities suddenly seemed endless. In the wake of the milestone announcement – which has already led to the development of an early stage prostate cancer test – interest in Circulating Endothelial Cells spiked globally, culminating in a world-first lecture on the clinical utility of CEC at the 2018 European Multidisciplinary Congress on Urological Cancers (EMUC18) in Amsterdam. As part of his address, Dr Bhakdi not only shared how X-ZELL managed to translate his breakthrough research into real-life applications for clinical routine – starting with early, pain-free prostate cancer detection – but also provided new insights into the cells’ true potential as a biomarker for early cancer detection. Due to high demand, X-ZELL decided to share the complete transcript of Dr Bhakdi’s Amsterdam presentation with our blog audience, edited for online use and complete with relevant hyperlinks and references. Could CEC change prostate cancer detection as we know it? “The central question we’re asking today is whether or not CEC may be useful as biomarkers to predict the presence of clinically significant prostate adenocarcinoma, which, in turn, could contribute to reducing over-diagnosis of prostate cancer. Or in other words: Could CEC be used as a liquid biopsy to reduce unnecessary biopsies and over-diagnosis of prostate cancer? Why would that be worth a thought? To answer the question, let’s start at the beginning. Firstly, we all know that tumors need to grow blood vessels to grow and that there are no aggressive cancers without angiogenesis. What is less commonly know, however, is that impaired angiogenesis is associated with tumor dormancy. Histopathological evidence for this is underlined by the inverted ratios of pro- and anti-angiogenic factors harboured in platelets – not in plasma – in growing and dormant cancers, as shown by Almog et al. in 2010. 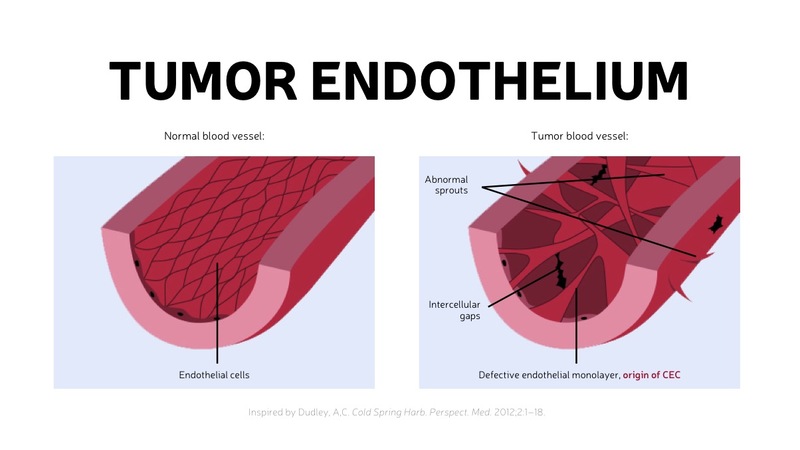 Secondly, the tumor endothelium itself exhibits important hallmarks of cancer tissue, such as atypical cell morphology, pronounced nuclear aneuploidy and loosened tight junctions between adjacent cells (Dudley 2012). Lastly – and this is where it’s getting really interesting – there is a whole body of research indicating that microvessel density (MVD), a measure of tumor angiogenesis, can be prognostic for the course of disease. It all started with an in-depth evaluation of cancer cell morphology in the early 1990s, with researchers stating that prostatic intraepithelial neoplasia (PIN) likely served as a precursor of prostatic carcinoma. Subsequent research then looked into quantifying MVD by using CD31 as a pan-endothelial marker, CD34 as a marker for growing endothelium and angiogenic tip cells, as well as CD105 (Endoglin) as marker for tumor angiogenesis. However, it turned out that assessing cell morphology in combination CD31 expression alone did not suffice to accurately predict clinically significant cancer, which affected the reputation of MVD and caused scientific interest to drop dramatically. It wasn’t until recently that the predictive potential of MVD –assessed both by CD34 and CD105 – was fully acknowledged. Now, however, studies even point to the fact that MVD correlates with Gleason score. With that in mind, we wanted to see if we could detect CEC shed from these microvessels and find out if they might be able to serve as biomarkers for aggressive prostate cancer. When we embarked on our journey – a collaboration between X-ZELL and Mahidol University – it was clear that CEC could not be isolated from whole blood by targeting a single antigen, given previous research had attempted just that and failed. Firstly, we remove red blood cells by lysis. Secondly, we deplete white blood cells by buffer-optimized magnetic cell separation – we first published this method in 2010 in the Malaria Journal and subsequently in the Journal of Magnetics, among others. Finally, or the actual characterization of leftover cells, we developed a 9-color immunofluorescence staining process allowing us to analyse the sample on standard laboratory slides under a fluorescence microscope. At X-ZELL, we call that final step Cryoimmunostaining™ (the underlying technology is now for sale for research use, ed.). Cryoimmunostaining™ is different from existing technologies because it does not require any spectral unmixing post-staining, meaning the cell analysis is very straightforward on a modern multichannel UV microscope. We just published the biophysical background and a detailed protocol in the journal Material and Methods. As part of our analytical validation process, we demonstrated that we lose a maximum of 20% of cancer cells during the lysis process. White blood cell depletion is equally stable at around 99%, with less than 10% of cancer cells lost. Finally, Cryoimmunostaining™ may lead to maximum cancer cell loss of 10%. As a result, we preserve well over 50% of cancer cells in our in vitro model. Going into clinical validation, we noticed that the cells we discovered in patients with prostate cancer matched exactly those described for microvessles in prostate cancer – CD31, CD34 and CD105 positive, CD45 negative. In many cases they also came with striking aneuploidy, just as Dudley described from tumor endothelial cells and pathologists would expect from cancer cells. We never found these cells in healthy donors – encouraging us to take the next step by setting up a prospective, blinded clinical study at Siriraj Hospital in Bangkok. Patient enrolment for this study took place between October 2016 and October 2017, with long-term follow-ups still ongoing. All 170 patients were biopsy-naïve took our CEC test prior to 12-core TRUS biopsies. PSA values covered a very wide range from below four into the thousands. As a starting point, we established that the predictive values of PSA alone were similar to those we had previously see in reference populations across Asia, with PPVs increasing from the lower 20s to 100% for PSA values over 80 or 100. 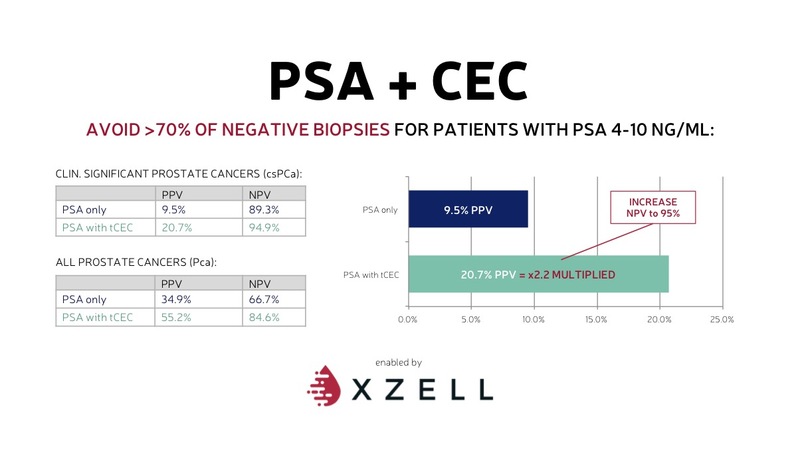 The data showed that for patients with PSA in the 4-20 grey zone, the chance of a positive biopsy for clinically significant cancer is below 20% at any rate, which I believe is similar here in Europe. As such, we take these findings as an indication that cancer prevalence in our patient cohort at Siriraj reflects the actual cancer prevalence seen across the region. So, what happened when we slotted in our test after PSA and before the tissue biopsy? We came to the conclusion that by doubling PPV and pushing up NPV, this could save over 50% of all biopsies, or over 70% of negative biopsies – without missing any or only very few patients with significant cancer, depending on the PSA bracket. Taking into account existing literature about tumor angiogenesis, MVD in prostate carcinoma and the results of our first clinical pilot, we stand by our bold hypothesis first shared in Brisbane – tumor-derived Circulating Endothelial Cells predict the presence of clinically significant prostate carcinoma. To validate our claim, we are currently wrapping up a 1,000-patient follow-up study co-funded by the Thai Research Foundation at the same hospital. What’s more, we are in the middle of submitting the IRB application for a second, 300-patient two-centre study in Singapore featuring the National University Hospital as well as Singapore General Hospital. On top of that, we have also entered into a new research collaboration with Dr Natalia Bednarz-Knoll from the University of Gdansk to explore further applications of CEC in prostate cancer diagnostics.